Today I have an older manicure for you. I did this about a month and a half ago but never ended up posting it for whatever reason. So - let's get ready to travel back in TIIIIIMEEEEE! I did this right after I had a super tragic break. I find shorter nails are easier for me to stamp on, so I took out my plates and searched for a design that I liked. I really gravitated towards this triangle design from Shany plate SH22. I bought the Shany plates on Amazon.com. I started with a base of Wet N Wild Ready to Pounce, which is a dark dark purple from Wet N Wild's elusive and coveted Halloween 2011 collection -- On the Prowl. Then I took out my Sally Hansen Chrome Pens, which I found on sale at Walgreens, and chose the gold one. The pens are really nice for stamping, I can confirm. The problem with this manicure was in the plate, I think. Some parts of the design didn't transfer, some transferred partially... I am not exactly a stamping loser. I've got a lot to learn, but I at least consider myself competent. Having said that, I had a really hard time using this design. The Shany plates are pretty thin and flimsy feeling (not to mention having super sharp edges), so it's not much of a stretch to say that it was the culprit of my problems. Despite my trouble with the plate, this manicure turned out okay! The base was a bit too dark for my usual tastes, but it was a nice departure from what I consider my usual polishing style. You would not have been able to tell you were having troubles with the stamping! It turned out great and I love the color combo. Very cool. It looks like gold glitter. Looks great. I think the difference in transferring makes it look more interesting and less like a "stamp". In this case, at least. Wow, this looks pretty good! I love the stamping design. it's a bit retro. Love it! This mani looks stylish and cool! wow i love this! reminds me of the big gold shard glitters! love the mani and the length of the nails!! Beautiful, it looks like mirror shards. Really like it! Stamping never ceases to amaze me. It is crazy how cool nails can look now a days. I love it, simple yet elegant. Noone would know you were having troubles with stamping, it looks perfect to my not pro eyes! 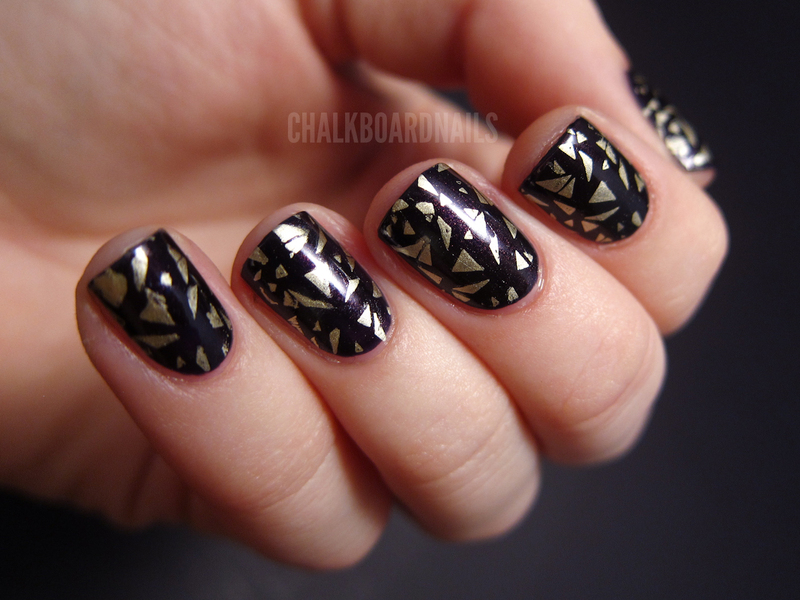 Love this mani, so edgy!